Black history month, which is held every October across Britain, is going strong in Lambeth. This year’s activities in Lambeth have been crammed full of inspirational, fun and thought provoking events, which are still going on. On behalf of the Stockwell team, we’d like to congratulate all the organisers of the 2009 programme. 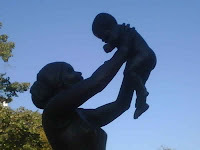 The picture is of the Bronze woman monument in Stockwell.